Rachel Lutzker talks with Connecticut’s Kid Governor. Fox 61. February 8, 2019. Click here for the story. CT ‘Kid Governor’ calls for support of LGBTQ issues. CT Post. January 21, 2019. Click here for the story. CT ‘Kid Governor’ calls for support of LGBTQ issues. CT Mirror. January 18, 2019. Click here for the story. CT Kid Governor takes office. Fox 61. January 18, 2019. Click here for the story. 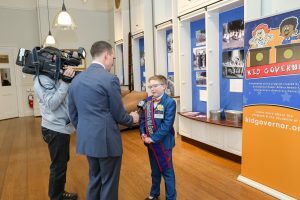 Kid Governor sworn in with LGBTQ platform. WTNH. January 18, 2019. Click here for the story. Connecticut swears in new ‘kid governor’. News 12 Connecticut. January 18, 2019. Click here for the story. Connecticut’s Kid Governor Wants to be a Voice for LGBTQ Community. NBC Connecticut. January 18, 2019. Click here for the story. CT’s new Kid Governor sworn into office. WFSB. January 18, 2019. Click here for the story. 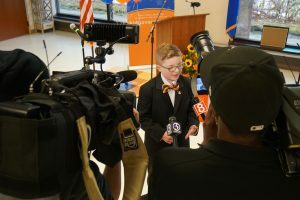 East Hampton 5th-grader inaugurated as Connecticut’s newest Kid Governor. Hartford Courant. January 18, 2019. Click here for the story. CT Kid Governor Says Love Won the Election. NBC Connecticut. January 17, 2019. Click here for the story. 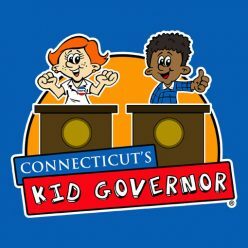 Hartford area students campaign for Kid Governor Election. West Hartford News. December 26, 2018. Click here for the story. Girl Wins Kid Gov on LGBTQ Platform. Rivereast News Bulletin. November 30, 2018. Click here for the story. Promoting her platform of LGBTQ youth safety, 5th grader Ella Briggs elected Connecticut’s Kid Governor. Boston Spirit. November 28, 2018. Click here for the story. East Hampton girl, Avon student elected Connecticut’s Kid Governor. The Middletown Press. November 26, 2018. Click here for the story. Avon student selected to be next CT Kid Governor. WFSB. November 21, 2018. Click here for the story. Connecticut ‘kid governor’ focuses on LGBTQ youth safety. Miami Herald. November 21, 2018. Click here for the story. Connecticut ‘Kid Governor’ Focuses on LGBTQ Youth Safety. NBC Connecticut. November 21, 2018. Click here for the story. Connecticut ‘kid governor’ focuses on LGBTQ youth safety. Fox 61. November 21, 2018. Click here for the story. Connecticut 5th graders elect East Hampton’s Ella Briggs ‘Kid Governor’. Hartford Courant. November 21, 2018. Click here for the story. Avon’s Ella Briggs named next Kid Governor. WTNH. November 21, 2018. Click here for the story. Connecticut ‘Kid Governor’ Focuses on LGBTQ Youth Safety. U.S. News and World Report. November 21, 2018. Click here for the story. Students across Connecticut look to elect next Kid Governor. WTNH. November 6, 2018. Click here for the story.